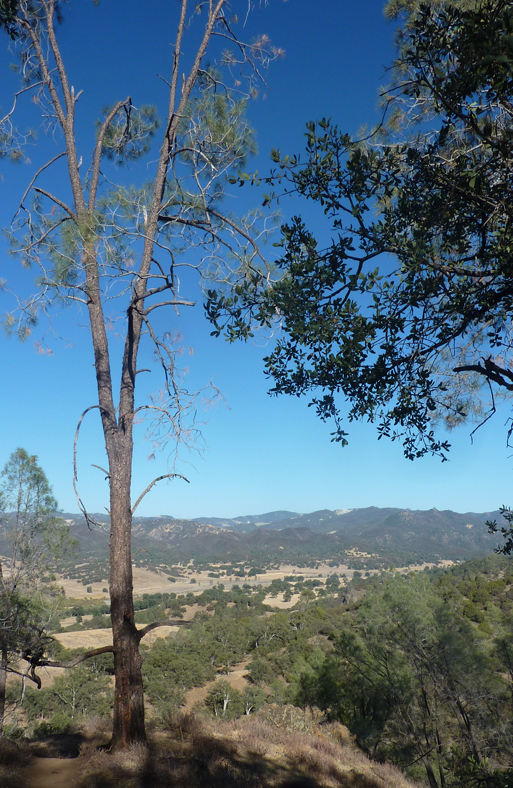 The following is my report about our visit to Laguna Mountain, in California’s Hernandez Valley, nestled between the coastal and Diablo mountain ranges. Chris Kelly, my friend Tim Berry, a TAC imager named Enrico, and I comprised the entire group that day and night on 07 September 2013. I knew we would be going to a really remote place. My goal was to experience what it would be like to try it from a one night perspective. Laguna Mountain, managed by United States’ Bureau of Land Management (BLM), is a long way to go, but you really get a sense of the central part of California from the drive down there, traveling through Hollister, passing by the east entrance to Pinnacles National Park on highway 25 . The location is just about exactly one hundred miles from base camp Houge Park in San Jose. It takes about two hours with no stops (as measured driving back to SJ in the very early morning). Highway 25 is a leisurely drive, but does get a bit twisty and a little slow in certain areas. It’s well maintained and can be fast in certain stretches. On your way to Laguna, on Highway 25, well past the Pinnacles, you come down off a hill where the road turns sharply to the right. 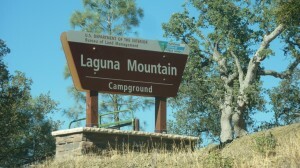 You see a sign pointing to the left toward Laguna Mountain Access, Coalinga Road. This road is not as well maintained, so the going is slower. The pavement is rougher, the road crosses several single lane cattle crossing grates, and low areas, dips, where bridges should be (but are not). 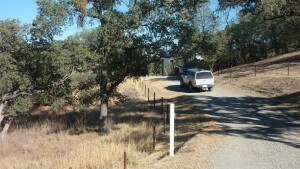 After about 25 minutes on Coalinga Road, you start to approach BLM land, with the Short Fence Trailhead parking area. 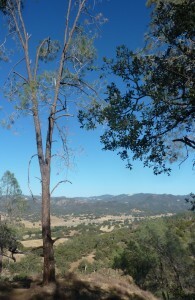 A little while later, while noticeably gaining elevation, you pass by the Sweetwater Trailhead and campground. A short while after that, you reach your destination, the Laguna Mountain Campground, so you make a right onto the gravel road. It leads up to the campground and terminates at a small clearing where there is a vault toilet building, an information kiosk, and the gate. 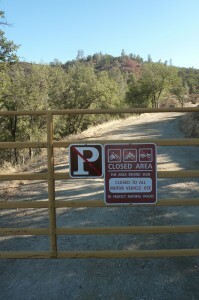 At the camping area of Laguna Mountain, there are five sites, on seemingly fresh crushed gravel; it’s a little dusty. There are shade structures, about 10 by 12 feet in dimension, on a concrete pad with a metal picnic table bolted, chained to the slab. Sites are decent sized and space away from each other, providing plenty of privacy. There is no water, so be sure to bring plenty your own. There are no trash cans, so you have to pack your trash out. There are fire rings but it’s hot and dry out there, I would hesitate having a campfire. Site 5 is the best, at the top of the hill, but it’s technically behind the gate. To use it, you would have to park in the clearing, near the gate/kiosk and haul all your stuff up the hill, about 30-50 meters around the gate, then back up again to the site. It has good views and is relatively flat, so you could even set up your gear there and observe right at your camp. UPDATE: I’m told that this site is fully available for the asking; contact the local BLM office (links are above in this post) or the SJAA’s Rob Jaworski. The observing area where we set up that night was up the hill beyond the locked gate. To get there, we had to drive about a quarter mile past the gate, for which Chris had the combination as he was also in possession of a permit. Driving up that dirt road, the biggest issue is one fairly steep section of road, maybe fifty feet in length, we had to climb with our vehicles. The 4WD vehicles had no problem but the one non-4WD sedan in our group did have problems climbing. A second run at the hill with more momentum and using a different track, with less loose dirt and rock, proved successful. If the surroundings are wet and muddy, this may be a significant problem as the grade would be impassable, possibly even to 4×4’s. At the top of a ridge, we set up right in the middle of the well graded dirt road, at N36 21.678′ W120 49.608′ (link to google map satellite view). Being in the middle of road, if another vehicle had happened to encounter and want to pass us, it would have been impossible unless we all broke down our equipment to let them through. Luckily and expectedly, there was no one trying to get to nowhere beyond to the mountain (or returning from it). South wasn’t perfect, horizon was slightly obscured by the mountaintop, but IIRC, all of Scorpius’ major stars were visible. 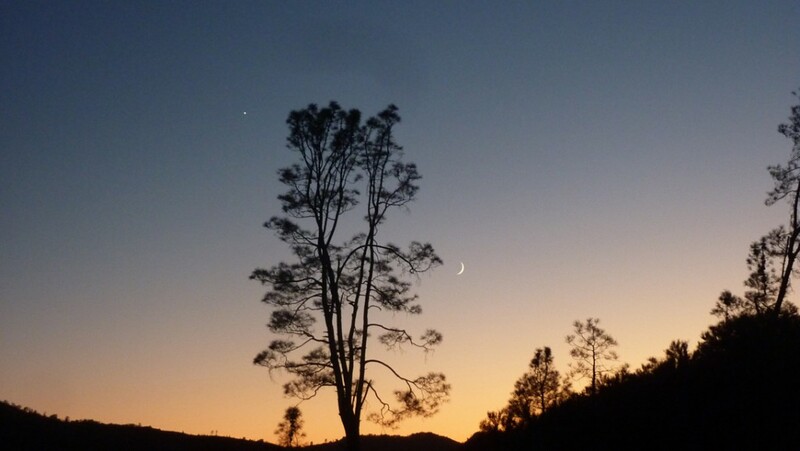 To the north was the Hernandez Valley, and you could see the reservoir; the horizon is pretty low, the Big Dipper swung all the way down and you can easily see all the stars in Ursa Major’s famous asterism. To the northwest, there is a distinct light dome coming from either Hollister or Soledad. Most of us argued for the former while Chris suggested it was the latter. Later, looking at maps, it was apparent that Soledad was the most likely candidate, being much closer and more to the west. Another, much smaller light dome was visible closer to due north, which matches pretty well to where Hollister would be. The hills to the east had a very faint glow coming from behind them, to which I guessed those were probably all the far off towns in the central valley blending together. To the south, there was nothing. In the valley below us, to the west, there were only two, very faint and very far off lights coming from a ranch house or barn. You have to stand up tall and look over the brush to see them. You won’t even be able to point at them with most scopes, especially dobs. Other than that, locally, there was nothing else, nothing but occasional coyotes yapping in the distance. This is more of a site report than an observing report, but I’ll make small mentions of what we did up there in the dark. Chris was all over the place with his C14, as usual. Enrico was imaging and showed us versions of the eagle nebula, which looked best in red, though green looked red, and so did blue. Confused? So was I; I don’t image. I did manual searching around through the awesome Milky Way, pretending I was an eighteenth century Herschel or Messier, trying to find random things in my XT8. For some reason, I fixated around Delphinus, and found NCG 6834 pretty easily. A lot of my time was also just taking in the dark sky naked eye, what a fabulous place we live, our galaxy. We weren’t disappointed with space pebbles crashing into our perfect-for-us atmosphere, many of which seemed to travel from west to east across the southern sky. It just so happened we all saw one come straight down to the south, fiery green, smoke trail and all. We were all using some flavor of Sky Safari all night, a bunch of silhouettes walking around in the dark with dim, red flat panels in our hands. Tim DeBenedictis does a great job of trying to obsolete paper charts, yes he does. I had obligations the next day, so my buddy Tim and I packed it up and were on the road back to the bay area a little past midnight. We expected to see lots of wildlife on Coalinga Road, then highway 25, but we were all alone. All we saw, the whole way back, was the fuzzy tail of a scampering mammal, as it was disappearing into the roadside brush. I won’t mention the small number of nocturns hanging outside the just-closed social establishments of Tres Pinos; they don’t count. Summary: This location is good for people looking for dark skies, and imagers, who don’t mind the drive and would be willing to spend the night, driving back the next day. It’s not well suited in its current form for any sort of organized event. The location could handle perhaps a dozen observers, perhaps a bit more, scattered throughout the ridge and the campgrounds. I would certainly list it as a place to go and check out with your gear. The land managers are asking for suggestions for improvements and are trying to draw more visitors to come and use their sites in this area. If you like remote, this is the place.